Indicated Airspeed | Stratos Jet Charters, Inc. Indicated airspeed is the speed at which the aircraft is flying as indicated by the airspeed indicator. 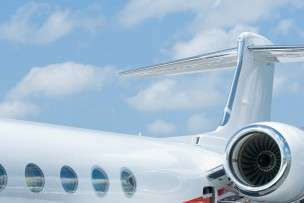 The private jet speeds are determined either mechanically or electronically using the difference between total pressure and static pressure. The instrument readings are not corrected for instrument error, temperature, density, and altitude. The Pitot-static system is the main tool used to determine the indicated airspeed of an aircraft. This systems consists of a Pitot (Pee-tow) tube, a static port, and instruments used to display the readings. The Pitot tube can be found mounted near the front of the aircraft. Once the aircraft starts moving forward, air is forced into the tube, and the pressure inside the tube is calculated by the system’s instrumentation. The static port is located in an area separate from the Pitot tube, usually one that is undisturbed by turbulence from the aircraft. This allows the port to read the airflow without interference from the control surface of the plane. In more simple terms, the indicated speed is the value denoted by an airspeed indicator obtained through the pitot-static system. True airspeed, in terms of private jet speeds, is a relative measurement. It’s referred to as the actual flight speed of an aircraft relative to an air mass. This measurement is commonly used for navigational purposes.